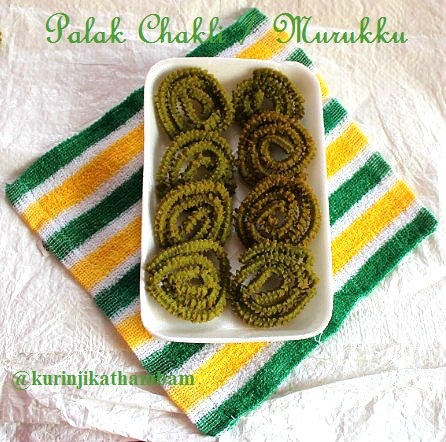 Palak Murukku is a very famous snack in Bangalore and I saw it being sold on the streets of many Bangalore areas. When I saw the recipe of this murruku in a magazine, I wanted to try it out. It came out very well. Since it is a good health snack, I recommend this to be tried out. 1. Clean and remove the thick stem of the palak leaves. Wash the leaves and keep it aside. 2. Heat one cup of water in a wide bowl. Bring it to boil and switch off the flame. 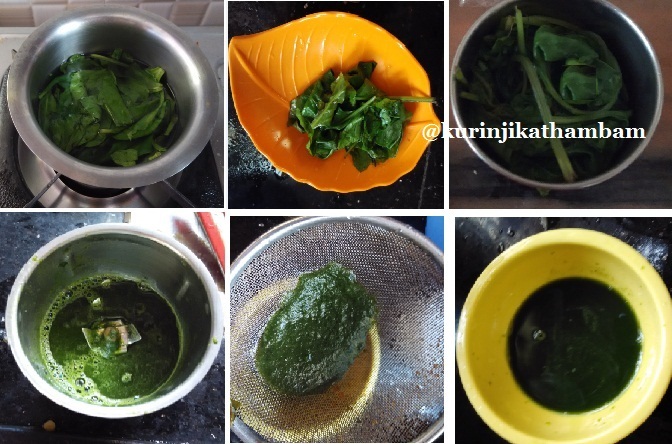 Then put the washed palak leaves into the hot water. 4. Grind them into a fine paste using mixer grinder with little water. 5. Extract the juice from the paste using the strainer. Keep it aside. 6. In a wide bowl, add rice flour, urad dal flour, ajwain and butter. Mix them well with your fingers. It should look like a bread crumbs. 7. Now add the palak water (from step 5) little by little and knead a soft dough. Add enough palak water only to make dough. If you have excess water, you can use it for other purpose. Otherwise you don’t have enough palak water to make dough, you can add normal water. 8. Take the murukku-press and choose the design as per your wish. I used star design. (mullu murukku design). 4. 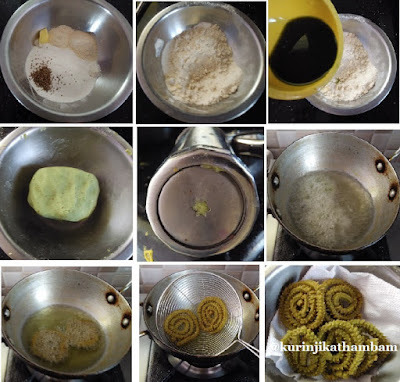 Grease the murukku-press with oil, then fill the murukku-press with dough upto ¾ of the press. Press a round shape on the ladle. I used 2 ladles for quick process. 5. 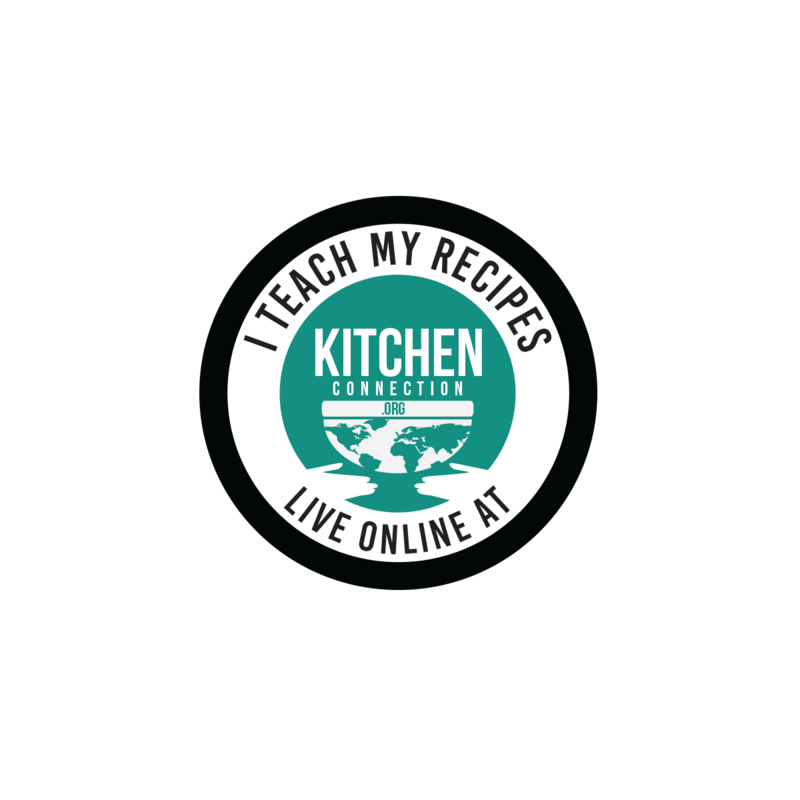 Heat the oil in a pan till it becomes hot or put a pinch of dough into the oil. If the dough comes up immediately, then this is the correct stage of oil heating. 6. Now flip the ladle over the oil. After a min, flip the murukku and cook till the sizzling sound reduces completely. 7. Take it out from the oil and drain them using tissue paper. Repeat this for remaining dough also. Allow it to cool down completely and store it in a air tight container. Healthy and tasty murukku is ready.